73 fj40 with hard top, bikini and soft doors included. pile of associated parts from years of the PO collecting. all in all i have about 3500 in it with trades and cash. 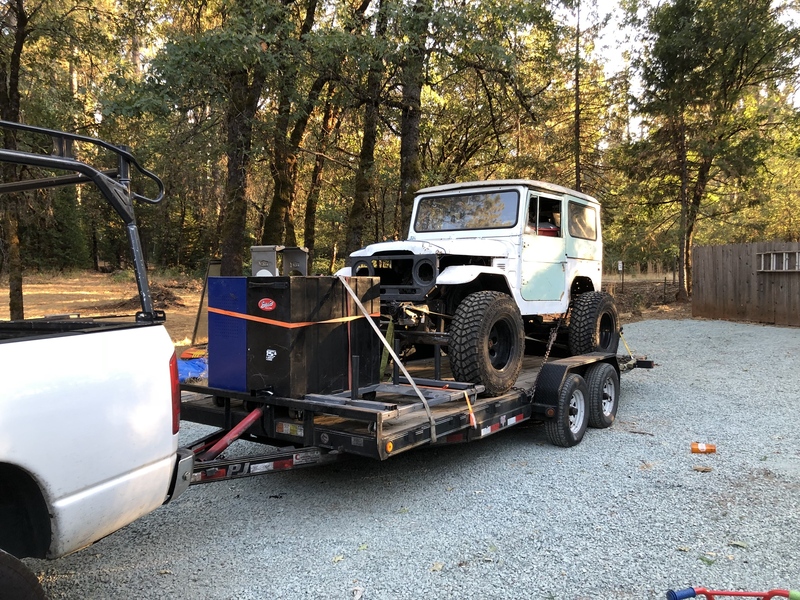 now to figure out what i am going to keep from the T100 build for the FJ and what is for sale because the wife will not let me build both or do i really have the time to. got a little done on her lately. probably about 64-1/2" wide with the axles that came in it. pulled the dana and threw in my fj80 widened axle and swapped the springs around to gain about 4" to wheel base. 75" outside of tire to outaside of tire with the old axle and 35's not 84" with the fj80 and my 37's and rims. pulled off the giant rear bumper. anyone need a rear winch bumper? trying to get the motor stabbed in with he trans next to show conflicts with the 3 link as i am fabbing. Your widened Toyota axles make it much better. I'm not much on the fj platform but I will be watching this one for sure. thanks man. i know the landcruiser stuff is traditionally more of a old guy restoration project than avid wheeler but i have always loved the classic looks and simplicity of these things. I figure if i build it and absolutely hate it i bet i can still sell it and build a t100. the t100 deals come by more often than the deal i got on the fj40. badass man! ill for sure watch this one. so are you selling the t100? Yeah unfortunately this project puts the T100 on the chopping block. Good side is I have the parts from the T100 to use on this build or sell off for the right parts. I am definitely using th Toyota axles over the Dana axles because they are wider and I have been building them for way too long to not use them. I will also be using the 3 link kit and coil overs on this. 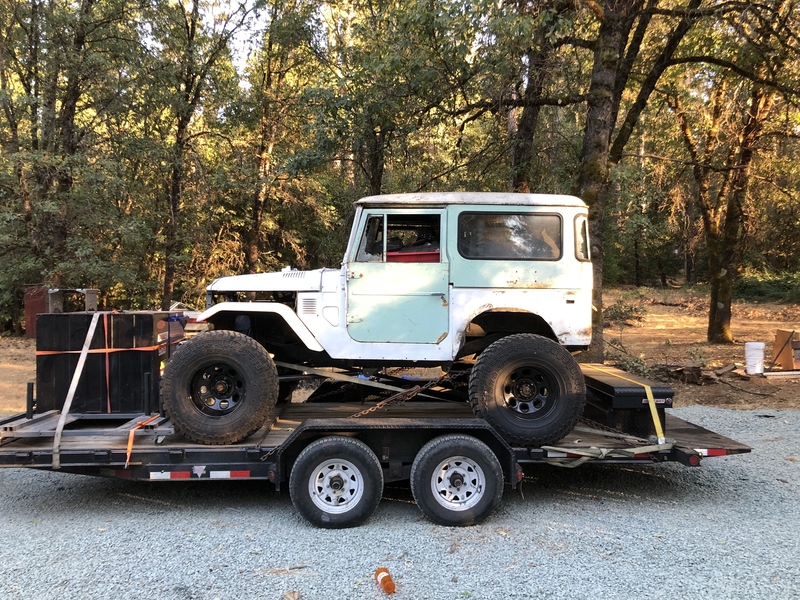 I now just need to sell enough parts I am not using like the Dana axles, dual ultimate cases and v6 adapter to help pay for parts to finish the fj40. I am really hoping to get enough funds to throw a atlas behind the sm465 instead of the no205 I have for some crawl gearing. NV4500/atlas 3.8:1, old but never been run. got too good of a deal to pass up. just need to buy fluids for it and swap the yokes for Toyota. I have not looked super close but I am assuming at this point my drivetrain weak link is going to be u joint or pinion flange splines. I guess only time will tell. not a whole lot done last night but I did get the yokes swapped out for toy flanges. turns out this atlas was built in 2002 so it was still a 26 spline front output and 32 spline rear. luckily WFO down the road had a dana 44 to toy flange that fit the bill perfectly and a 32 spline toy flange for the rear. also wire wheeled the nv4500 to give it a little paint to keep it from rusting any further. hopefully this weekend I can pull the motor and get this bolted up and stabbed in. need to rebuild a new cross member now also. so not as fast getting them swapped as I hoped but that is life. pulled the motor and trans last night but first had to build a little jack extension to put under the transmission because I was tired of the old stacking of wood block sketchiness. I used a short piece of axle shaft and a scrap of 1/4" plate to fit on the jack and a tube and angle iron slip on attachment to get the extra height. this seemed a lot more stable than the 4x4's I used to stack on the floor jack to get extra height. I did get the motor out so now to bolt up the new trans and transfer case and fab a cross member to hold it in place and then get to the links. engine in the fj40, take 2. This time with the NV4500/ Atlas bolted up. also looks like I only have about 21" for the rear drive shaft with where the axle is now. I am so used to Toyota minitruck stuff where you have miles of rear drive shaft so this makes me really nervous. I think with the rear leafs I have now I could probably push the axle back another 2-3" before I have to get into mounting the shackles off the back of the frame. do you guys out there in keyboard cowboy land think 24" long for a rear CV shaft? I need to figure angles based on final ride height because this thing is getting lowered a bunch, but 24" sounds short to me. not a bunch to report but I finally received my knuckles and FROR keyed histeer arms back and I am pumped!!!! these things are BEEF! in this last picture you can see the machined part on the knuckle so the hi steer arm slides down over the top of the knuckle by roughly 1/4". should help keep some of the strain off of the studs. I installed the ARP's and the stock bottom studs and then bolted the knuckles on with a temp tie rod to get ready to mock this thing up under the truck. I think I grossly miss estimated the caster angle I tacked the knuckles on at because the hi steer arms seem turned up really far but hopefully I can get it under the truck where I think ride height will be and turn them to be right and then start getting the link mounts in place. so a little more done over the weekend. got the axle rolled under the truck and started planning location. I broke the tacks and rotated the knuckles to 7 degrees caster with the pinion pointed to the t case so it should be closer to actual now. just trying to figure out how far forward and how high to place bump right now. 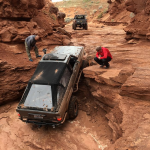 where I have it in the pictures is about 1" from the tie rod hitting the frame, and the axle is about 4-1/2" forward from stock. If I move it back about 2" I can get the bump higher or I might have to notch the frame. I really want to keep 6" uptravel from ride height and keep it as low as possible for CG reasons. then I threw on the tires and fenders for some reference and motivation. she is definitely wide! and I am definitely going to need to do some custom fenders but I am thinking moving the axle back 2" and notching the frame is where I will probably go next, just need to make sure firewall clearance is good for a 40 for possible future growth. once i get the axle location figured out i plan on building the links backwards of most. i figure i will tack them in place where they fit well then throw those numbers in the calculator and then start massaging from there. i figured there was no reason to come up with link lengths and position in the calculator just to find out they wont work under the truck. Can't wait to see this thing in person. thanks man. hopefully it will be in a driveable state by the time you get here! not a big update but I finally got some time to work on her. picked up two IFS CV drive shafts from a good friend for free and cut one apart to start mockup on the front shaft. I got lucky and just happened to have some drive shaft tubing I was given by a friend a while back that looks to be real close to the right length. only buzz kill is my Toyota flange on the atlas does not have the CV pattern so I am going to have to take it off and drill it for the new pattern. I also tacked in the lower links and raised the axle until the tie rod would hit the frame to see how it would look. this will require some notching for the drag link for sure but would gain me 2" of up travel hence lowering the ride height 2". right now the lower links are 44" eye to eye and I think the upper is going to end up around 36-40" I think. in the last two pictures you can see I started to try and place the upper link in there and it is tight. if I had it strait up and down it would contact the nut on the fan belt. I angled it back to where I think it would fit at full bump and have a little clearance for adjustment but it brings my vertical separation down to around 6" which is slightly concerning. I am also going to probably have to bend my upper link some to clear the motor mount unless I rework the motor mount too. if I can make this as my full bump it would put my frame height at full bump around 16.5" so if I add in 5" up travel it would put me about 21.5" to frame at ride height, then 2" down or so for the belly pan would make the belly around 19.5". this is a little low but I can always turn the shocks up to around 6" up travel and get my belly over 20 if needed. What is the vertical separation you are shooting for. Can you extend the mount to get it. I have a feeling if I extend the bracket at all I will end up getting into the accessories and other belts. I think on the top hole in my adjustable mount I should be able to get to 7" of separation. I am just not sure if that will be enough. back to searching build threads to see what others have gotten away with. I can always break the tacks on the lowers and rotate them down but then it will put the lower less flat at ride height which I was trying to avoid. and they become a rock anchor. this thread makes me feel better about 6"-7" vertical separation. I got the atlas flange drilled for the CV pattern for the front drive shaft and threw that in and dropped the axle 5" on my axle holding jig to estimate ride height. then I threw together a temp drag ling from some extra SS pipe I had laying around. I am liking how flat the drag link is around ride height but I think I might see if a flat pittman arm with the hiem below woud help raise the steering box end just slightly and help keep it from being the low point when at full bump. I also measured the lower links and they are about 3 degrees upward at full bump and about 4 degrees down at ride height. I think this is decently flat so should have ok manners on the road. then I threw a fender and tire on at the estimated ride height for a visual. looks a lot less crazy wide down near ride height. I am definitely going to have to build tube fenders or move these fenders up to hood level almost to clear the tires when articulated. no real big updates besides this thing will be being put on hold for a while. I just accepted a new position in Yakima WA so I will be moving and needing to find a new home before I can start work on it again. I packed inside with all my spare parts and a lot of tools. I think I might look for different wheels though. I was about a 1/2" wider than my trailer is inside the fenders. having a little less offset would make loading a lot nicer. I don't know too much about the hiems because they were given to me by my friend Mike Honcho but they are a 5/8" bolt. I had FROR drill the highsteer arms so I didn't have to.